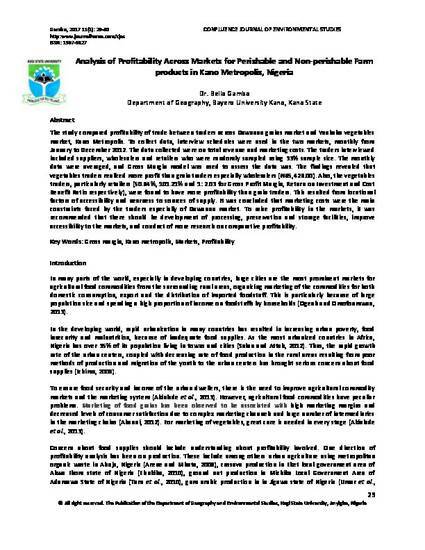 The study compared profitability of trade between traders across Dawanau grains market and Yankaba vegetables market, Kano Metropolis. To collect data, interview schedules were used in the two markets, monthly from January to December 2012. The data collected were on total revenue and marketing costs. The traders interviewed included suppliers, wholesalers and retailers who were randomly sampled using 33% sample size. The monthly data were averaged, and Gross Margin model was used to assess the data was. The findings revealed that vegetables traders realized more profit than grain traders especially wholesalers (N65,426.00). Also, the vegetables traders, particularly retailers (50.64%, 101.21% and 1: 2.03 for Gross Profit Margin, Return on Investment and Cost Benefit Ratio respectively), were found to have more profitability than grain traders. This resulted from locational factors of accessibility and nearness to sources of supply. It was concluded that marketing costs were the main constraints faced by the traders especially of Dawanau market. To raise profitability in the markets, it was recommended that there should be development of processing, preservation and storage facilities, improve accessibility to the markets, and conduct of more research on comparative profitability.